The author, Robby Charters, provided me with a copy of this novel in exchange for my review. The start of Pepe held such promise. Charters set a scene and laid the path of a little boy in a deeply unstable world. He lives in the very dangerous Dockyard District with his “sister” Po and once their Grandmother disappears, the pair is on their own. In Pepe’s world there are really no questions to be asked. Survival is the primary focus. A strange old man saves him from a miserable situation and says that Pepe should come to him if he’s ever in trouble. As the story progressed there seemed to be a problem with pacing, Charters develops the characters in a way that at times is independent of the story and causes the plotline to drag. The benefit of this development is that it cannot be said that Pepe is not a well laid out character. 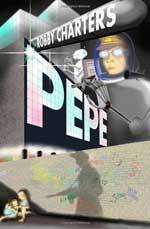 Pepe is developed at the expense of other characters. It would seem logical to me to have a bit of development with Atsuko, the mystic. Clearly he’s a man of mystery but that sense could have been maintained with perhaps a little more insight into how he came to be where and who he is. What Charters does do really well is to keep his futuristic setting simple and somewhat familiar. Life has changed dramatically, but we’re not so far into the future to throw readers who don’t tend to enjoy futuristic settings off. Earth is a mess and the President holds his office for life. The political setting and the dangers presented to the main characters are not so out of whack with traditionally conceived science fiction. Unmet expectation seems to be my biggest struggle with this novel. Pepestarted so well and built a sense of hope and then just fizzled as the tale went on. If you have a middle grade boy this might be a book he’d like. This novel holds a high star rating on Amazon.com, so if the premise looks good to you, give it a shot and let me know what you think. Robby Charters splits his time between Ireland and Thailand. He is the author of several books including Eetoo, The Wrong Time, The Zondon and The Eurasian. For more information about Robby Charters and his work, visit his website. You can connect with him on Goodreads, Facebook and Twitter @robbycharters.